This past Saturday, instead of making favors as I had planned, I was surprised with a shower. I was caught completely off-guard so in all the pictures I am wearing this unphotogenic t-shirt and old shorts (and just when I was thinking about buying an outfit that's not so dressy so as to not seem as if I had been planning it all along b/c I never get dressed up unless I have to, but not so casual so as to be a slob, as I was that day). I won't share details about how I really was not prepared to be in the public eye that day, the least embarassing of which was how I didn't have face lotion (I stayed in Queens the night before at fiance's urging of getting as much work done as possible) so I used some free sample I got from Missha and it wasn't very good for me. But all these things slipped my mind b/c I was really too stressed and busy to pay much attention. So before we got to where we needed to go, I told fiance that I was dressed like crap (I just threw the t-shirt and shorts in a bag b/c I was rushing to work the day before and I wanted to pack light) and I didn't want to leave the car but he used the same old excuse he always uses -- he has to stay in the car b/c I'm a sucky driver. I noticed the silhouette of a motorcycle (really a Vespa but I couldn't tell) in the driveway (behind the gate) and I made a mental note to ask MOH who in her family bought one. As I approached her door, I found it odd that it was not pulled shut and when I slowly pushed it open, I saw a familiar face (actually the person who owns the Vespa) and in my mind, I wondered why this person was sitting on the floor and why she was at my friend's house. Then all these ppl yelled "SURPRISE!" and it started to sink in... the terror... of interacting w/ ppl... especially when I'm totally unprepared and dressed like a bum.... I remember thinking no, it's too early! I'm not ready! I want to go home and change! I want a do-over!! But it was too late, all these ppl had their cameras and camera phones, snapping pictures as I stood there dumbfounded in all my bummish glory. I had to yell for them to stop taking pictures (which they didn't listen to anyway) but it soon became OK when I saw the all ppl who came just for me! One by one they came up to me, said congratulations or some mushy wish, and hugged me. I was really touched that all these ppl would suffer the agony of my grumpy company and the atmosphere of a shower (often horrible to all but the honored showeree). 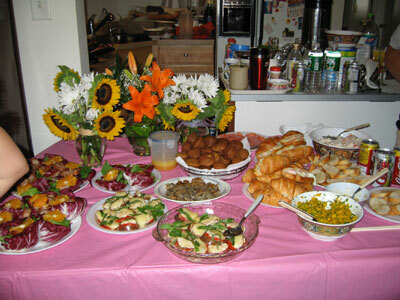 I was really impressed -- there was a huge spread of brunch goodies that MOH's good friend prepared as a gift to me. She also contributed a bunch of stuff for prizes, including a Kate Spade bag (which I won in a raffle! 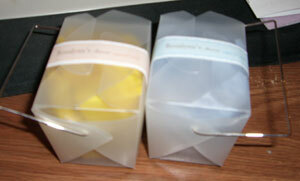 ), and various other kinds of Asian-inspired bags and pouches. And another good friend (who just recently got married), planned a bunch of games, as well as arranging some flowers for the buffet table. She also packed cute little favor boxes with Hershey's Kisses and closed each one w/ a very pretty ribbon-esque tie that she printed out in various colors. from left to right: salad with mandarin oranges and roast pork (she couldn't find duck breast) in radicchio bowls, potato hash thingy (in middle), broiled eggplant and tomato topped with cheese and basil, banana nut mini muffins, shrimp salad on croissant, smoked salmon (hidden behind the croissants), spicy mango salsa, garlic bruschetta to go with a salmon spread. Not shown are the delicious mimosas mixed with a cheap (but very tasty) wine and sparkling cider. Unfortunately, I was really stuffed from the huge breakfast that fiance made for me (fruit salad with double egg, ham and cheese sandwich) so I couldn't try everything (gotta lose the poundage!!) but what I did try was delicious!! Looking at the picture actually makes me want to try everything I couldn't before! We also played Scattergories with the first three letters of my name (so hard! ), Present Bingo, and the purse game (also embarrasing b/c my bag is so junky and full of crap). Besides the various bags, prizes also included Coach keychains in the shape of a dogbone (very cute!). I think I was still reeling from the surprise and unpreparedness of everything at night (I had trouble sleeping and I'd have random memories of the events of the day). 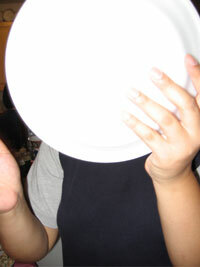 But it could have been worse -- I could have had a zit, my worst fear (which came to fruition later that night). So on that note, I leave you with these zit-zapping remedies. A dab of toothpaste overnight usually shrinks zits for me. A glob of Mario Badescu drying cream works well too (it stinks of sulfur though). And lastly, here's a recipe I got from Daily Candy (but haven't yet tried), which featured a make-at-home zit cream from Karen Axmaker, a facialist at Sally Hershberger Face Place. 2. Mix everything else in a small bowl. 3. Cover blemish with mixture and leave on for twenty minutes. 5. Store leftovers in fridge for up to one week. (Do not eat.) Apply twice daily until pimple disappears.